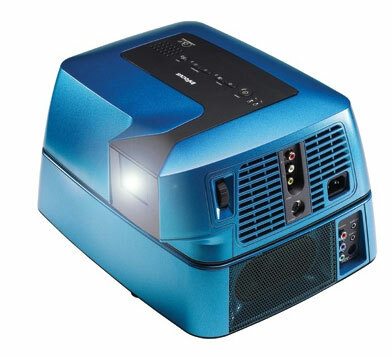 InFocus Play Big IN1 Video Game Projector | OhGizmo! InFocus launched a new projector today aimed at the gamer crowd called the InFocus Play Big IN1 projector. The projector is aimed at gamers playing on the Wii, PlayStation and Xbox gaming systems, but can be connected to other input sources like DVD players and cable boxes as well. Amplified speakers are built into the projector so you get sound to go along with your big screen gaming experience. If you room is big enough to get the projector far enough from the screen or wall, you can get an image 8-feet wide. The projector uses DLP technology and has a native VGA resolution of 640×480. Other resolutions are supported as well with 480i, 576i/p, 720p, and 1080i. Video inputs include S-video, composite, and component. Brightness for the projector is 500 lumens and the contrast ratio is 1500:1. Overall dimensions are 4.69” x 12.6” x 9.5” without the audio module and 8.5” x 13.35” x 10.39” with the audio module. The IN1 is available now for $499 exclusively through Woot.